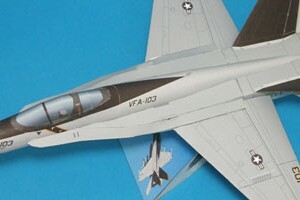 One more addition to Paper Replika F-18 Hornet paper model collection. 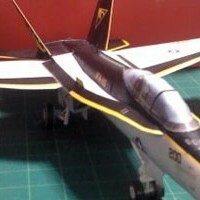 It was repaint by our friend Kim again, it is a model of Hornet from VF-115 The Eagles Squadron which operated from October 1996 to June 2001. The squadron stationed on USS Abraham Lincoln. The latest squadron of VF-115 now is using Super Hornet on board USS Ronald Reagan since January 2007. The model on photos below was built by tientien from papermodeler cafe. 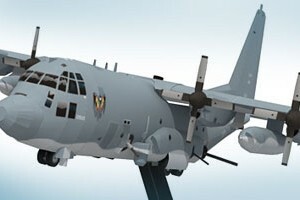 This AC-130U Spooky Gunship aircraft paper model is actually requested by many paper model builders couple years ago until now. Also the requests for a new livery for C-130 Hercules keep coming to me, so why not I take the challenge? I thought it was an easy task to re-color this model plane, but apparently it was not, as usual. I found out I had to re-model the vertical stabilizer and all the engines, I was not satisfy with the old ones. That's not all, I also remove all glue tabs and made separate inner glue tabs, so the assembled model will have smoother profile. First time I know this gunship was from a local aviation magazine, but that was not amazed me yet until I saw it in Transformers the movie (TF1) and play as a Spectre gunner role in Call of Duty : Modern Warfare and in later Modern Warfare 3. As a bonus I added a display stand in this template, the scale is still the same, 1:100. 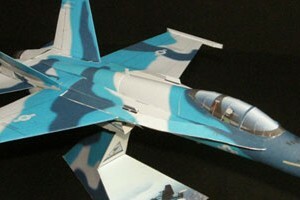 Kim is back again with his Jolly Rogers F-18 Super Hornet. When I open his mail I thought wow this is a very neat recolor. In my knowledge it's a lot harder to re color the template alone without the builder file. Recoloring is easy for me who have the 3d builder file, but Kim always managed to recolor perfectly. This Super Hornet is one of VFA-103 Jolly Rogers Squadron stationed on USS Carrier John F. Kennedy. This hornet is one of Naval Strike and Air Warfare Center (NSAWC) aircraft trainers. NSAWC is a main Naval training center and air tactics development located in Fallon, western Nevada USA. This hornet uses blue splinter camo, a distinctive Russian camo. That's why it is called Aggressor, it play as an enemy plane in training. 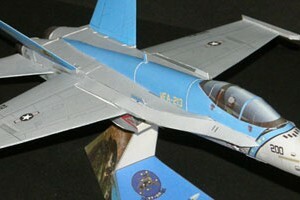 The templates is modified from Paper Replika's F-18 Blue Angels by our friend Kim. Assembly instructions please refer to F-18 Blue Angels paper model kit.